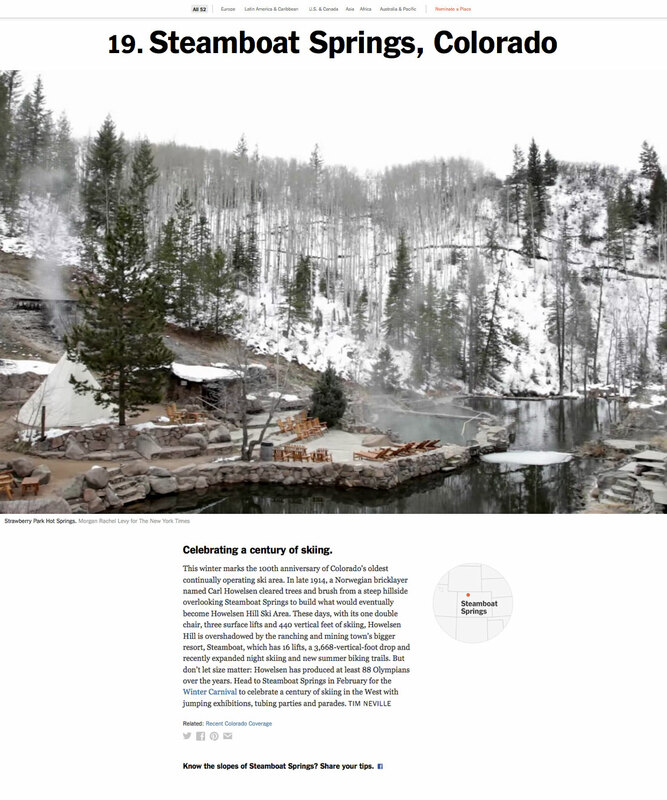 When it comes to surprising and delighting an unsuspecting digital consumer, The New York Times achieves this with high marks via its 52 Places to Go in 2015 article page. When I visited the page for the first time, I zipped past one destination after another, quickly taking in the gorgeous widescreen images and the name of the corresponding city, country or region. When I got to #19 Steamboat Springs, Colorado, I paused to read the description. Were my eyes playing tricks on me? Or was the water in the picture actually moving?!? Steam rising from a geothermal pool. Smoke piping out of a nearby tipi. I immediately became enamored with the fact that Team NYT has sprinkled a dash of magic and life into a digital article — in a tasteful and non-obtrusive way. And in a way that did not slow the page speed to a mind-numbing crawl. I proceeded to scroll past other seemingly still images that suddenly sprang to life. And my swift and casual scroll of the 52 must-see locales of 2015 soon morphed into a bit of a scavenger hunt to find all of the videos hidden in the page’s digital haystack. A time-lapse video loop of the Schuylkill River Trail in Philadelphia at night. A video loop of a chef cutting gorgeously-thin noodles with a massive saw-sized knife. The page is mobile responsive, beautifully and simplistically so. The surprise-and-delight videos only play on a desktop browser; so smartphone and tablet users don’t get to partake in the awesomeness. Which is oh so sad. Seeing how it’s 2015 and all.